Build a countryside getaway with the Small Cottage. This cosy creation is the perfect LEGO brick-built vacation home with everything a minifigure needs to unwind. Put the sausage on the grill, cruise around on the skateboard or swim in the pond. Take off the roof and open the rear of the Small Cottage to explore inside. This LEGO set features a lamp, drawers, swivel chair and a table. Rebuild it into an impressive windmill or skater’s house for even more cool LEGO creation destinations. Open the skater’s house with hinged walls to play inside or grind on the rails with the skateboard. Spin the blades of the windmill and repair it with the wrench. Set also comes with minifigure. This toy costs approximately £19.99 (for the latest and best prices make sure you check our retailer list for the LEGO Creator Small Cottage 31009 above). 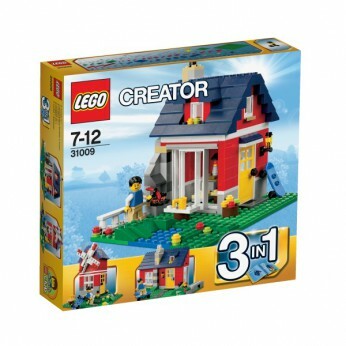 In our review of LEGO Creator Small Cottage 31009 we classed it as being suitable for ages 6 years, 7 years, 8 years, 9 years, over 10 years but recommend you check the manufacturer specific advice before purchasing.